Scentsation Honeysuckle from Proven Winners is a showy vine with extremely fragrant yellow flowers from mid-spring to late summer, followed by bright red berries. It has a very long bloom time, making it a wonderful addition to summer gardens, and can be trained up a trellis or fence. It attracts birds and resists deer. 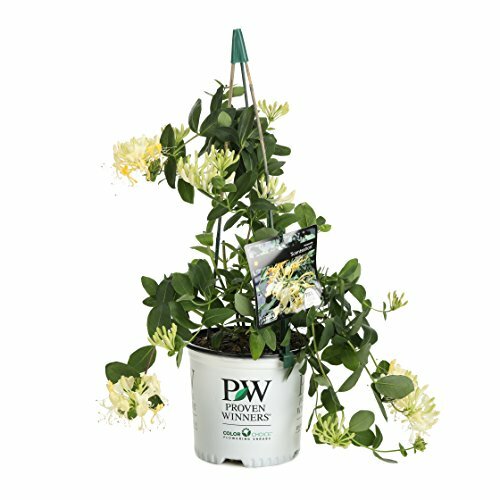 Scentsation Honeysuckle from Proven Winners produces fragrant yellow flowers followed by red berries. It has a long bloom time, attracts birds, and resists deer. It can be trained up a trellis. Prefers full sun (6+ hours) and is adaptable to most soils. Grows to be 10-15 feet tall and 5-6 feet wide. At time of shipment, this plant will be about 1 year old. Blooms from early to late summer. Pruning not needed but may be trimmed after flowering. One gallon shrubs are 6-18 inches tall when they are shipped, depending on the season. Hardiness zones: 4-9. Be sure to check your USDA Hardiness Zone if you want this plant to come back year after year. This honeysuckle looks beautiful in landscapes and is a wonderful addition to summer gardens, especially when trained up a trellis or fence.